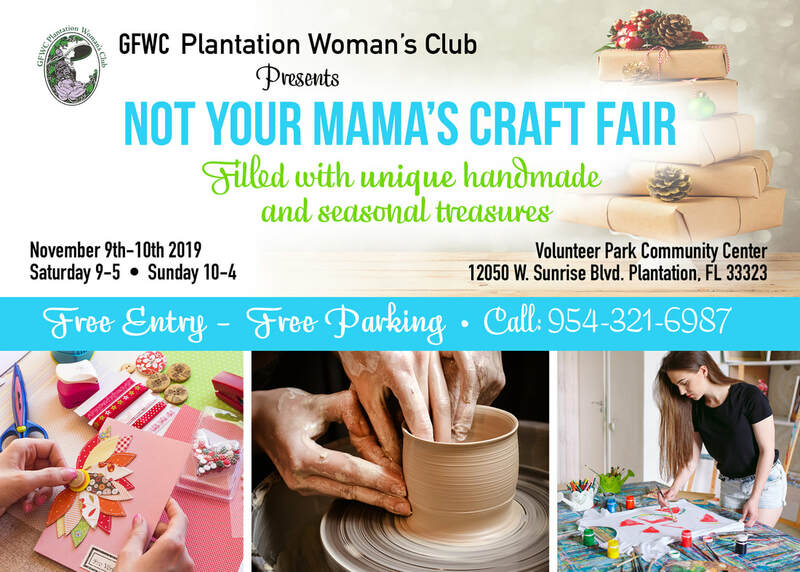 "Not Your Mama's Craft Fair"
Be a part of this exciting new fund raising project! The GFWC Plantation Woman’s Club cookbook, "Flavors of Plantation" can now be pre-ordered for delivery in early December. What a perfect gift for the holidays! This cookbook includes more than 350 favorite recipes submitted by our members, the Mayor of the City of Plantation, members of the City Council, as well as friends, neighbors, family members and residents of our city. This cookbook is a fundraising project for the GFWC Plantation Woman’s Club. Net proceeds will help to support our many projects, including scholarships for local students, donations of equipment to our police, fire, and parks departments, as well as many others. If you are interested in ordering one of these fabulous cookbooks, please click the button below which will lead you to the order form. GFWC Florida is excited to join with partner Operation Smile for the 2018-2020 administration. GFWC Florida President Sharon Oliphant has chosen “Smiles Across the Miles” as her theme for the next two years. During this time a fundraising goal of $250,000 has been set. In order to accomplish this goal, GFWC Florida clubs will be asked to assist with awareness and projects to share Operation Smile. A surgery cost of $240.00—and with that, a cleft palate or lip can be repaired with no cost to the recipient or family. A GFWC Florida sponsored mission trip with a few lucky participants will be organized for the 2020 year. We hope that as GFWC Florida members you will be a part of “Smiles Across the Miles” and help us reach this attainable goal for the 2018-2020 administration.